This warmed my heart. It was a great event with nice turnout. All the kids left with a program, folder and could get an autograph. Yes, Virginia, Hockey players can read. Oh, man - and you had a moose visit the library? That's awesome! 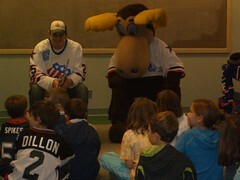 Actually the Amerks are sending players to several of the Monroe County Library System branches. Its a program they worked out with the branches. This was at the library where I had my first post-MLS library job, as part-time outreach Children's librarian. They've also added a neat twist, For every hattrick of books you read (3) a child under 12 gets a coupon for a free ticket to any Amerks home game. Each time they do that, they're entered into a drawing for 6 tickets to a game, and dinner in the President's luxury box.